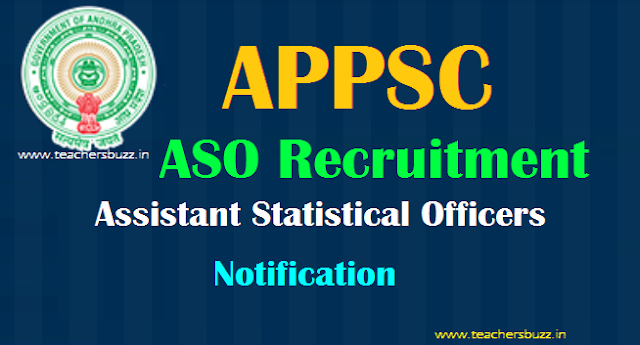 Assistant Statistical Officer in A.P.Economics and Statistical Sub-Service Notification No.03/2019 - APPSC ASO Assistant Statistical Officers Recruitment 2019, Apply online till March 6 . APPSC Assistant Statistical Officer Recruitment 2019 AP Govt Jobs- APPSC 78 AP ASO/ Assistant Statistical Officer Jobs Recruitment 2019 Notification. Andhra Pradesh Public Service Commission released notification for the recruitment to the posts of Assistant Statistical Officer promptly. So, candidates who were eagerly waiting for this jobs they may enroll the through the link which is given below. The Details about eligibility criteria, age limit, salary, selection process and application process available at official website https://psc.ap.gov.in . The A.P Economics and Statistical Sub Service has released Assistant Statistical Officer Recruitment Notification. The total number of vacancies to be filled by APPSC ASO Recruitment 2019 is 78 posts. The online submissions for APPSC ASO Vacancies will start from Februrary 12,2019. The AP ASO Jobs Apply Online link will automatically Active on official website psc.ap.gov.in. So, people hurry to use for this most recent advertisement. Download the official AP Assistant Director Notification 2019 and know the required eligibility details. After that, go to main home psc.ap.gov.in and complete the registration process. (v) Bachelor’s Degree with Computer Science (with Statistics as a paper in one year or two years or all the three years as the case may be) as one of the main subjects. Age: No person shall be eligible for direct recruitment if he/she is less than 18 years of age and if he/she is more than 42 years of age as on 01/07/2019. The proforma Application will be available on Commission’s Website (www.psc.ap.gov.in) from 12/02/2019 to 06/03/2019. Before applying for the post, an applicant shall register his/her bio-data particulars through One Time Profile Registration (OTPR) on the Commission Website viz., www.psc.ap.gov.in. Once applicant registers his/her particulars, a User ID is generated and sent to his/her registered mobile number and email ID. Applicants need to apply for the post using the OTPR User ID through Commission’s website. Submission of Online application: 12/02/2019. exceed 25,000 in number and likely to be held on 19/05/2019. The proforma Application will be available on Commission’s Website (www.psc.ap.gov.in) from 12/02/2019 to 06/03/2019. APPSC Assistant Statistical Officers recruitment 2019, Syllabus, Scheme of exam, Qualifications, selection procedure, How to apply, how to fill the online application form, Written exam date, Application fee, hall tickets, results declaration date, selection list preparation method, instructions to the candidates and more details to be announced by the APPSC Website.